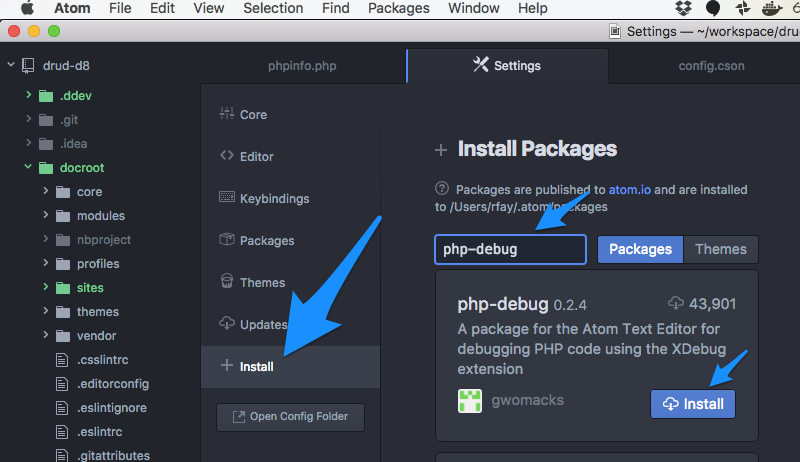 Every ddev project is automatically configured with xdebug so that popular IDEs can do step-debugging of PHP code. It is disabled by default for performance reasons, so you'll need to enable it in your config.yaml. xdebug is a server-side tool: It is installed automatically on the container and you do not need to install it on your workstation. All IDEs basically work the same: They listen on a port and react when they're contacted there. So IDEs other than those listed here should work fine, if listening on the default xdebug port 9000. For more background on XDebug see XDebug documentation. The intention here is that one won't have to understand XDebug to do debugging. For each IDE the link to their documentation is provided, and the skeleton steps required are listed here. PHPStorm is a leading PHP development IDE with extensive built-in debugging support. It provides two different ways to do debugging. One requires very little effort in the PHPStorm IDE (they call it zero-configuration debugging) and the other requires you to set up a "run configuration", and is basically identical to the Netbeans or Eclipse setup. Visit a page that should stop in the breakpoint you set. PHPStorm run/debug configurations require slightly more up-front work but can offer more flexibility and may be easier for some people. Under the "Run" menu select "Edit configurations"
Click the "+" in the upper left and choose "PHP Web Application" to create a configuration. Give it a reasonable name. Add file mappings for the files on the server. Click on the local repo path and add "/var/www/html" as the "Absolute path on the server" and your repository root as the path on the host. Start debugging by clicking the "debug" button, which will launch a page in your browser. Atom is an extensible developers' editor promoted by GitHub. The available extensions include php-debug which you can use to conduct PHP debugging with the Xdebug PHP extension. This project is currently an alpha release. Open a project/folder and open a PHP file you'd like to debug. Open the debug view and enable debugging by choosing Packages->PHP-Debug->Toggle Debugging. You should see "Listening on address:port 127.0.0.1:9000". Visit a page that should trigger your breakpoint. Set a breakpoint in your index.php. If it isn't solid red, restart. Click the vscode debug button: . Go to a page in your project, you should hit your breakpoint. Then change your IDE's configuration to listen on the new port.